Denver Green Chili is a regional specialty and is found all along the Colorado Front Range. This Denver Green Chili, my secret family recipe, made in the classic Denver style, is a secret no more. Rich and silky, just thick enough to smother a burrito and gently pool, it has just the right amount of heat. Enough to catch your interest, to be sure, but not enough to cause any distress. Just marvelous flavor that will tickle your tongue, then wrap around and settle a bit toward the back of the throat. I just love this Green Chili, and so has everyone I’ve ever served it to. If I were dying, this Denver Green Chili would be my last request. And it might very well revive me, it’s that good. Then I’d request it the next time! (Although I would urge you not to wait that long to make it!) Before we go any further, just to clarify for anyone that’s not familiar with Green Chili and/or green chile and might be confused with the different ways I spell chile/chili, Chili with an I is the finished sauce like stew, Green Chili; Chile with an E is the vegetable its made from, green chile. My Denver Green Chili – it’s going to cause cravings, maybe even withdrawal symptoms if you don’t eat it on a regular basis. Originally developed when I lived in the Mile Hi City, I’ve refined it over the 30 plus years I’ve been making it. See, I couldn’t seem to find this style of Green Chili anywhere after moving to the Twin Cities so of course, I had to make my own. Denver Green Chili, at least how it was made during my years in Colorado, before everything became so “Cheffed” up (Tomatillos? Really? That’s a New Mexico thing) is simple, down-home cooking. Even though I have had versions very similar to this recipe in some restaurants, I always tend to think of Green Chili like this where the meat is “stewed” (as opposed to cut into chunks that are sauteed and then simmered just until tender) as more like a home version. Many versions of Denver Green Chili, but not all, have a little tomato in them, and over the years, it seems like the tomato versions have gotten more popular. I think that’s partially because so many dive places that had great Green Chili (often w/o tomatoes) were located in the marginal areas around the outskirts of downtown. They were lost to the Stadium and the prosperity the Stadium brought to the area. But then food evolves, right? Tomatoes give Green Chili a pinkish or reddish hue. If you love that, add a can (15 ounces or 29 ounces, your preference) of petite diced tomatoes to the recipe. Me? I love my Green Chili pure – and just that, Green. When I first posted my Denver Green Chili, I did so on the Ranting Chef. He had a contest, and I didn’t win, even though this Green Chili has won several contests in Denver and one in Minnesota, just minor ones. I thought it was time my Denver Green Chili recipe came home, here, to my blog, but if you want to read my original post on the Ranting Chef, click over. You’ll love the Ranting Chef. Great cooking; his stories will charm you and his recipes will keep you going – you’ll never be at a loss for something to make. His site is so good I don’t even resent not winning – too much – anyway. After all, it’s not easy being green! A Bowl of Green: Usually served in a wide, shallow bowl, garnished with sour cream and cheese – in the Denver area, the utensils aren’t always used and it is often served with a side of refried beans. The old-timers tear off a bit of tortilla, fold it up and use it as a scoop. A Mexican Hamburger: I’m not sure how “Mexican” they are, but a well-done hamburger (in the places I ate in the Denver area, these were always thin, griddled, & well done, with a crust) is sprinkled with cheese, tucked into a tortilla and smothered with green chili and more cheese. And don’t forget the garnishes! 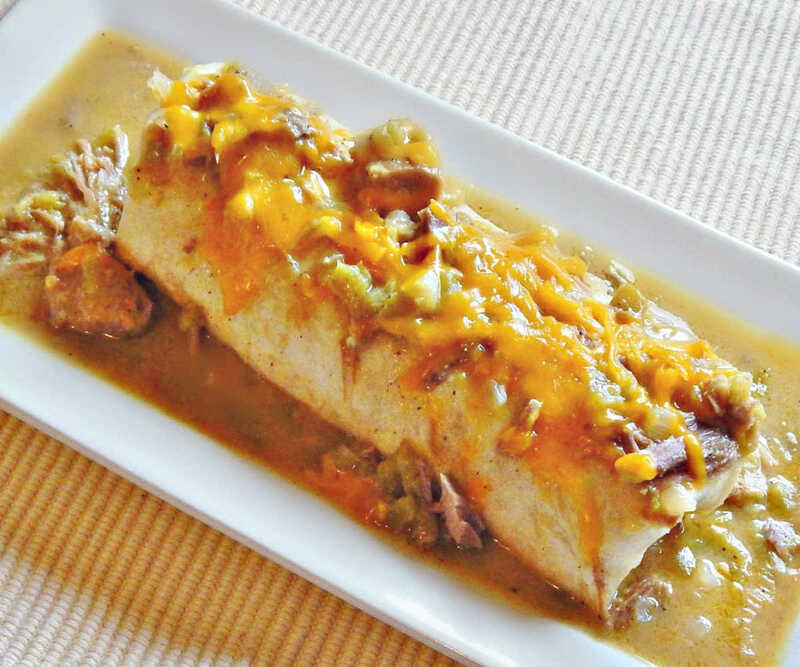 A Smothered Burrito: Any filling is good here, and probably the most common one is a ground beef filling, but really great are simple refried beans or pulled chicken – just use something that doesn’t compete with the Green Chili and its own special blend of spiciness. Garnish as desired – it’s the Chili that makes these great! A Cheesy Green Chili Queso Dip: Simply heat a little green chili with some grated cheese a few minutes in the microwave. Make it as cheesy as you want and use whatever cheese you want but I like half GC and half grated cheese and my fave cheese is a Monterrey Jack. Serve with tortilla chips and let the party begin! Breakfast Burritos: These are my favorite things to make with this Green Chili. A pound each of sausage, cheese, & cooked hash brown potatoes, a diced and sautéed onion and enough Green Chili to moisten, rolled in tortillas. Make a dozen or a bunch to freeze. I’ll walk you through them step by step in my post on Green Chili Breakfast Burritos. Denver Green Chili as long as you’re cooking the pork for the stock, make extra for all kinds of things. Depending on where you live, Green Chile can be harder to find and a little pricey – if you’re in the Southwest, you can buy green chile, roasted, on street corners where the vendors roast them up and sell them. I used to buy and freeze, and one year after I moved to Colorado, a good friend (thank you Margaret!) brought me a bucket of them when she visited. If you don’t have that kind of access, don’t want to mail order and aren’t able to buy larger cans of green chile, you’re probably going to be stuck with the small 4 ounce cans. Stock up on them if you use them, during the Cinco de Mayo sales (often unadvertised) or when you happen to see them on sale. Pork shoulder is one of the cheapest proteins you’ll find. Grab a few when they’re at their low in fall and chuck them in the freezer. One thing I didn’t mention in my recipe: sometimes I make a lot of pork shoulder – more, really, than needed for the Green Chili – then I can shred it for all kinds of things – burrito filling, enchiladas tacos, flautas, tostadas, etc. It’s not “hot” but has a wonderful flavor. Of course, you can doctor it up as desired – it’s really good shredded with barbecue sauce on buns, too. My Denver Green Chili recipe makes a big pot and I use it in so many ways that I rarely freeze this. When I do, I’ve noticed it does thin out a bit. Sometimes a little, but sometimes a lot. What the difference is, I’m not sure. Depending on what I’m using the thawed green chili for, I may or may not thicken it back up. When I do, I heat up the green chili in pan to a simmer. In another, I melt a little butter in a pan, add an equal amount of flour and stir until it thickens up to a roux. I then ladle a little of the green chili into the butter/flour mixture, stir it together, then add all of to the pot of simmering Green Chili and let it cook for a moment or two. It will thicken right back up. Place roast in a large stockpot, cover with 2 quarts of water, add onion, garlic, the two teaspoons salt, 1/2 teaspoon pepper, and chile pequin or red pepper flakes. Simmer gently until pork is tender but still holding together, about two and a half to three hours, depending on the size of the meat used. Shoulder will generally take a bit longer than chops. Strain stock, reserve, and set aside meat until cool enough to handle. Remove meat from bones and cut or shred into bite-sized pieces. May be refrigerated at this point, if desired, which makes it very easy to remove the fat from the stock. Skim fat from stock. When ready to proceed, heat bacon drippings (or a combination of the fat from the stock & bacon drippings) in a large stockpot. Add onion and saute until translucent. Add flour, stirring until flour cooks for a moment to two and is coated with oil. Turn burner down a bit and add about two cups of the stock, whisking vigorously, until a paste is formed. Continue to add stock in additions, whisking, until all the stock is incorporated into the mixture. Turn heat back up and bring to a simmer. Note: this is a quite a bit of flour to add to the small amount of fat, and a little care is needed to smoothly incorporate the stock into the flour. It is helpful to have a two cup measuring cup on hand to quickly dip out the stock and add to the roux mixture. After two or three additions, the roux is generally thinned out enough to add the remainder of the stock at once. Add in green chile and reserved pork. Add seasonings to taste, depending on the heat level you desire. Add bullion to taste. A restaurant version of this type of green chili is generally very highly seasoned and nearly always contains some bullion, while home versions may or may not. Taste for salt after the bullion is added. Your palate is the best indication of how much or how little spice and seasoning is desired. Simmer very gently for at least 30 to 40 minutes, stirring often, until the green chile is tender. If the Green Chili seems to be a bit thick and is sticking to the bottom of the pan as it simmers, add a little water until a desired consistency is reached. The finished chili should have a slightly thick, gravy-like consistency. A heart healthier Green Chili can be made by replacing the fat in this recipe with oil, although the fats tend to be the basis of some of the flavor. This entry was posted in Click here for Bargain Meals, Click here for Fabulous Food Posts and tagged Denver Green Chili, Family Recipe, Frugal Hausfrau, Green Chili, Hot Peppers, Mexican or Southwestern, Pork, Pork Shoulder Recipe. Bookmark the permalink. Thanks sweetie!! 🙂 Green Chili is often made with Chicken, too (when it is, usually it is thickened with a cornstarch slurry and a can of diced tomatoes and their juices go in ) and every now and then, when I lived in Colorado, I’d come across a Vegetarian version – although I’ve never made it that way. You must change that now & then! voted! Fingers crossed – hope you win 🙂 Really, how could you not?! And thanks much for the vote!!! myriam / rhubarb! rhubarb! rhubarb! voted! I’ve never had green chili before, it sounds delicious and warming. This looks amazing. I wish you success. Good luck! It looks awesome! I cooking up a batch of your split pea soup tonight for dinner, but this chili will have to happen soon. Still using up that 2 for 1 ham! 🙂 I seriously love the split pea – let me know what you think! Yep! Lots of ham to go. So the split pea soup was fantastic! I can’t believe how much flavor developed from such a simple list of ingredients. I had a bowl for breakfast this morning! And the price! I purchased every major ingredient at a discount (except for the split peas, but they’re cheap enough anyway). I have tons of leftover that we’re looking forward too. If I haven’t said thank you for your blog yet, THANK YOU! You’ve really helped me cut my food budget which helps make staying home with my son possible. I’m laughing because I often eat soup for breakfast! Or any other random foods left over! I’m not a big egg/bacon person nor do I like to eat a lot of carbs like pancakes, waffles, toast, bagels or donuts! I’m so glad some of my hints have helped you out, and glad you liked the Split Pea – I think it’s really the way the vegetables are sauteed that make it so good. It freezes VERY well – it separates when thawed but stirs right back together. I voted for your recipe even after reading the other 3 contestants. It just sounded so good. My ‘red’ chili is very good but I’ve yet to try to make a green version … yours sounds like a good one to start with. Thanks! And I’m always happy when someone thoughtfully considers all the candidates and STILL votes the “right” way! haha! I believe in giving credit where it’s due. With help from the net and reader suggestions I came up with 14 additional ways to eat chili (in the link posted above) when I first posted my recipe. I enjoyed reading your suggestions here as well. With regard to an earlier comment about using ham in split pea soup, even though our local Canadian sales aren’t quite as economical as the ones you enjoy in the US, I wait for our 99 cent a pound smoked picnic shoulder ham sale so I can buy a couple and make all kinds of goodies out of it, including soup. I’m still very proud of my ‘ham that conquered the freezer’ titled post. I’d rather eat many of the things made from left over ham than the ham, itself, especially soups like the split pea or the black bean! Last Christmas I replaced my usual turkey with a baked ham. It was delicious but all I could think of was what I was going to do with the leftovers. See, I do that, too! I’ll be slicing up the ham or sitting at the table and thinking that this is good, but my mind is already thinking about scalloped potatoes later in the week! I wish a had a little sticker to give out to the voters! Thanks for taking the time! Congratulations, voted for you and tweeted it. You deserve to win the chili sounds amazing. It is amazing, by the way – it’s really down home cooking for those from the Denver/Front Range area – and while I enjoy making some of the “Cheffy” recipes I see in books/magazines, this one is the Green Chili that is my favorite comfort food. It is nice to see you coming over to the chili side of the gourmet spectrum. Your talent is evident and I love your recipe, HF. It looks so incredibly delicious. Well done! Thanks – high compliments from someone who has cooked Chili for how many days? 320 or so in a row! But, I bet you didn’t vote for me…and I see, although it’s still early, you’re kickin’ my behind in the polls! 🙂 I do hafta say your Chili Pouitine looks great (and messy!) and is perfect fall/football fare. Alliteration accidental. Thank you for the kind words. I am looking forward to firing up your outstanding chili- in January. BTW, accidental alliterations are always amazingly awesome. Keep on Rocking in the Free World. I may regret saying anything that may have possibly been misconstrued as “smack talk” about your chili! Ok, ok, I DID smack talk ya! But now I see you’ve pulled ahead with 30 votes to my 29! Done and done. And I think I must try making a batch this weekend…looks delicious!